A 1966 Ferrari 275 GTB/C sold for $14,520,000 while a 1970 Porsche 917K set a new marque record of $14,080,000 at the Gooding Pebble Beach 2017 sale. 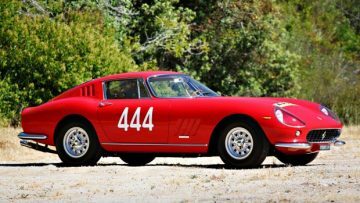 The top result at the Gooding Pebble Beach 2017 classic car auction was, as expected, a battle between the 1966 Ferrari 275 GTB/C and the 1970 Porsche 917K that the Italian car ultimately just won. The 1966 Ferrari 275 GTB/C sold for a new model record $14,520,00, as the highest result at the Gooding auction. The 1970 Porsche 917K raised the Porsche marque record by several million dollar to $14,080,000. 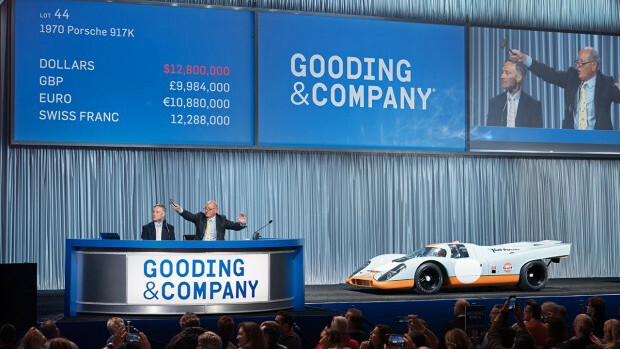 Gooding sold 22 cars for over a million dollars during the Pebble Beach 2017 auctions. 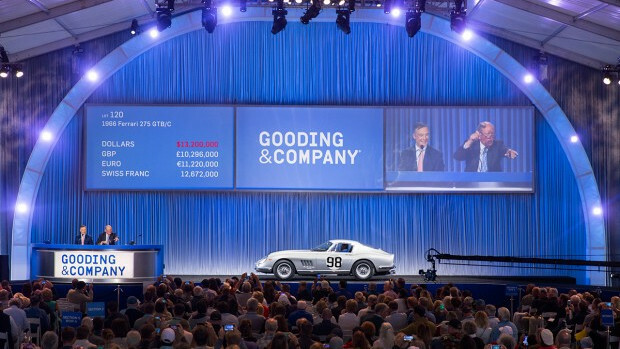 Gooding & Company, the official auction house of the Pebble Beach Concours d’Elegance®, held its annual Monterey Week classic car auctions on August 18 & 19, 2017, at the Equestrian Center in Pebble Beach, California. Gooding realized over $91.5 million with a sell through rate of 81% – 110 of the 135 lots offered were sold. The average price was $832,670 per car with 22 lots selling for above a million dollar with two cars selling for more than $10 million. In 2016, Gooding set a new company record earning $129,8 million in sales during the two-day event. The 115 of the 138 lots offered sold for a sell-through rate of 83% and an average of $1,128,606 per car. Gooding sold 26 cars for more than a million dollars with four selling for more than $10 million. First published results including premium. A new model record was set when the 1966 Ferrari 275 GTB/C, chassis 09051, with coachwork by Scaglietti sold for $14,520,000 as the highest result at the Gooding Pebble Beach 2017 classic car auction. This 1966 Ferrari 275 GTB/C was the sixth of only 12 competizione cars built by Ferrari based on the three racing 275s of the Scuderia Ferrari works team (and later raced by Ecurie Francorchamps). The car was extensively raced in period with numerous first in class finishes. This Ferrari 275 GTB/C car has not been shown since the 2007 Pebble Beach Concours d’Elegance, where the car scored 99 points. It has since received further mechanical and cosmetic work. A new Porsche marque record was set when a 1970 Porsche 917K sold for $14,080,000 at the Gooding Pebble Beach 2017. 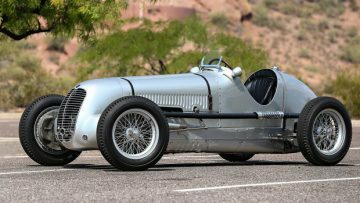 This was also the second highest price ever paid for a German car, after the 1954 Mercedes Benz W196R Formula 1 racer that achieved near $30 million at the Bonhams Goodwood Festival of Speed sale in 2013. The previous Porsche marque record was $10,120,000 paid for the 1983 Le Mans 24 Hours race-winning 1982 Porsche 956 in Rothmans livery at the Gooding Pebble Beach 2015 sale. Outselling a Le Mans winner requires some special provenance. The record-setting 1970 Porsche 917K, chassis 917-024, was mostly used as a testing vehicle by Porsche and thus has very limited in period racing history, although it did set fastest time in preparation for the 1971 24 Hours of Le Mans race that a sister car won. Porsche sold this 917K to Jo Siffert, who leased it to Steve McQueen’s Solar Production for use in the making of the Le Mans film. 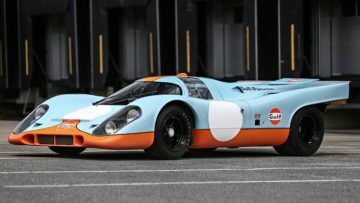 The Steve McQueen connection greatly added to the value of this Porsche and blue-orange Gulf livery on a 917 never hurts. A 1988 Porsche 959 Komfort sold for a disappointingly low $1,056,000 given the cars relatively low mileage of 8,200 km. A 1964 Porsche Carrera GTS sold within estimate at $1,540,000. A 1963 Porsche 356 B Carrera 2 Cabriolet sold for $1,250,000 in a post-hammer deal. No Porsche 911 derivative breached the million-dollar mark although the 1994 Porsche 964 Carrera 3.8 RSR came close with a $946,000 result. A 1959 Ferrari 250 GT Series I Cabriolet achieved $4,840,000 at the Gooding Pebble Beach 2017. This car was the last of only 40 cabriolets produced with Pinin Farina bodies. 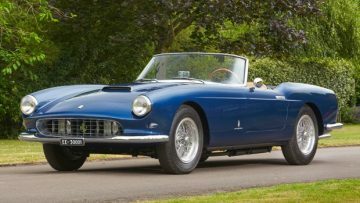 New, the Pinin Farina cabriolets were significantly more expensive than the Scaglietti California Spiders that are now amongst the most-expensive cars in the world. 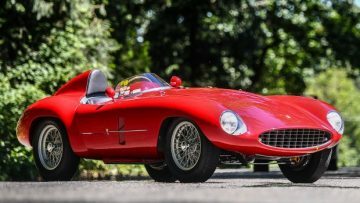 A 1954 Ferrari 500 Mondial Series I sold for $3,162,500. This car is one of only 30 4-cylinder Mondial racing cars built by Ferrari. The car was raced in period and famously won the 1955 Ethiopian Grand Prix. The Mondial participated in the Mille Miglia Storica in 1989, 1990 and 1991 and more recently was raced in California. The car is a matching numbers example with Ferrari Classiche certification. Four Ferrari LaFerrari cars were available at the Monterey Week 2017 auctions. The yellow 2015 Ferrari LaFerrari at Gooding Pebble Beach 2017 achieved a solid $3,520,000. It is one of the 120 US specification cars and has only 200 miles on the clock. It was the only top modern Ferrari offered by Gooding in the Pebble Beach 2017 sale. The white 209-mile LaFerrari at Mecum failed to sell despite a highest bid of $4 million while a red 566-mile 2014 LaFerrari sold at a hammer price of $3,450,00 (excluding premium). 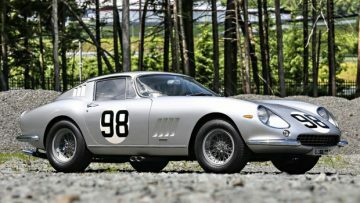 Gooding had another good result with a “lesser” 275 GTB when a 1965 Ferrari GTB sold for $2,585,000 – above upper estimate. This car was fitted with competition features from new – confirmed by Ferrari Classiche certification – and successfully raced in period to several class victories in Italy by its original amateur-racer owner. A further 1967 Ferrari 275 GTB/4 was withdrawn prior to the auction. A 1966 Ferrari 275 GTS sold for $1,700,000. This car is largely original and well maintained but has never been fully restored. It was the 198th of the 200 spiders produced. 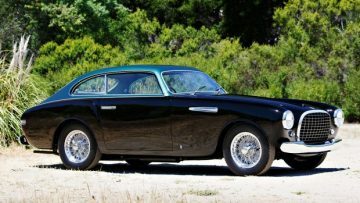 A 1951 Ferrari 212 Inter Coupe sold for $1,595,000. This early Ferrari has just been restored and is ready for the show circuit and historic races. A 1962 Ferrari 250 GT Series II Cabriolet sold for an excellent $1,375,000 – well above presale estimate. This Ferrari was brought out of long-term static storage and although it will require extensive restoration work, it certainly is not a rusty barn find. As with the dusty Gullwing in the same sale, it seems to confirm a continued demand for unmolested cars giving the new owner the option to preserve or restore. 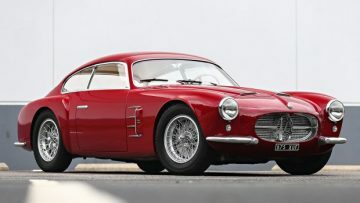 Gooding achieved a strong $4,400,000 for a 1956 Maserati A6G/54 Berlinetta with coachwork by Zagato. This was the last of only 21 cars fitted with this coachwork. This Maserati A6G/54 was originally sold in California where it was raced in period. Following restoration, the car was shown at the Concorso d’Eleganza Villa d’Este and thereafter displayed in the Ferrari Museum in Modena. The magnificent, if less practical, 1937 Maserati 6CM failed to sell during the auction with a highest bid of $900,000 but was sold for a million dollar in a post-hammer deal. This Maserati was driven to victory by Rocco at Coppa Acerbo and Circuito di Campione d’Italia but failed to finish most other races it was entered into. Rocco also set the racing lap record at Targa Fioro before retiring with a burned valve. A 1958 BMW 507 Series II sold for a model record and above estimate $2,750,000 at the Gooding Pebble Beach 2017 sale – no BMW achieved a better result in recent years. The BMW 507 was much more expensive and rarer than the Mercedes Benz 300 SL from the 1950s – only 252 were produced. Then, as now, the BMW is harder to sell and the strong result surprised after several of these models struggled at recent auctions. A time-wrapped, 61-mile 2003 BMW Z8 roadster sold for a sensational $440,000 – well above the seemingly generous $225,00 to $375,000 pre-sale estimate. Eight Mercedes Benz 300 SL cars were on offer at the Monterey 2017 auctions with Gooding alone offering two Gullwings and two Roadsters at Pebble Beach. 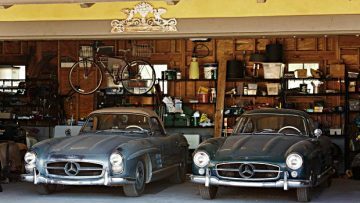 The more interesting cars were a Gullwing and a Roadster sold by the original owning family with both cars in a very original condition but needing some maintenance. A superb $1,677,500 was achieved on the dusty 1955 Mercedes Benz 300 SL Gullwing – a result for a Gullwing not seen since 2014. The 1957 Mercedes Benz 300 SL Roadster from this collection sold for $1,034,000 – just above the million dollar upper estimate. On the second auction day, Gooding sold a 1957 Mercedes Benz 300 SL Roadster for $1,347,500 and a 1955 Mercedes Benz 300 SL Gullwing for $1,265,000. Both results were well within estimate and higher than seemed the norm earlier in the year. At Bonhams, a Gullwing sold for $919,600 while a Roadster failed to sell with a highest bid of $880,000. The market direction for the 300 SL thus remains relatively unclear. 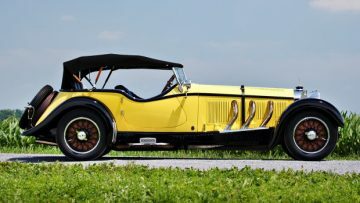 A 1926 Mercedes Benz 24/100/140 Phaeton sold for a sensational $726,000 – a new model world record and near double the pre-sale estimate of $275,000 to $375,000. A 1939 Bugatti Type 57C Cabriolet sold for $1,512,500. The chassis of this car was completed in 1939 but only sold in 1941 with the Letourner and Marchand coachwork only fitted sometime during the 1950s. 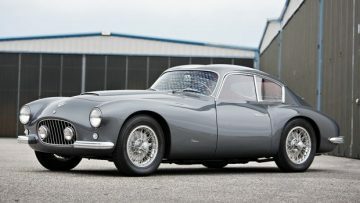 A 1953 Fiat 8V Berlinetta Elaborata sold for $1,485,000 – a good price for a beautiful car. Fiat 8V models are notoriously difficult to sell. A 1954 Aston Martin DB2/4 Drophead Coupe sold for $1,430,000 – a good result but Aston Martin action was more intense at the RM Sotheby’s sale. First published results, some of these cars might have sold in post-hammer deals. The yellow 1928 Mercedes Benz S Type 26/180 Sports Tourer with coachwork by Gläser was the most magnificent three-pointed star in any of the Monterey Week 2017 sales. The unsuccessful highest bid of $4,750,000 came tantalisingly close to the $5 million lower estimate but the car was not advertised for offers following the sale. Only five million-dollar cars failed to sell at the Pebble Beach sale – Gooding clearly judged the market well in the type of cars it brought to Monterey 2017.